Tonight I made Benjy the cutest wool soaker out of a shrunken wool sweater vest. I got the vest at a thrift store for $1.99. I washed it on hot to felt it even more. I used a pair of nylon pull-on pants as a pattern and made the soaker in about an hour or less. He's been wearing it all evening and I've changed several wet diapers, but the soaker isn't wet. The vest was a heather gray lambswool from Old Navy, so he's looking very fashionable right now! I think I am going to make a bunch of these. Thanks to Elissa for this Frugal Baby Tip! It's my first time to know that. Great idea, maybe I'll to make this one also. Thanks for sharing, very useful tips. Maybe I could save from buying diapers. I just made 6 wool soakers last weekend out of Salvation Army found sweaters. One thing I forgot to do was the whole felting of the sweaters but I did buy lanolin and go through that horribley messy process. So far my diaper covers are working fine. I even made some with long legs on them for night time. She loves wearing them and we can go all night with out having her, the bed and all her blankets soaked through. 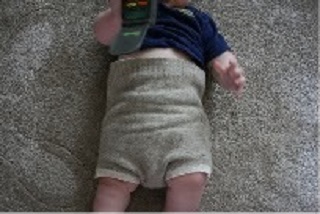 I have to thank the person who posted the pattern on this site for my ability to make my wool diaper covers. Thank You. Aaa, you're shaming me. I have two felted wool sweaters (one from Goodwill -- also an Old Navy find! -- and one a laundry mistake that no longer fit my husband...), and I have yet to make a soaker. And my little guy's 20 months old now. Maybe for the next baby I'll get around to it?